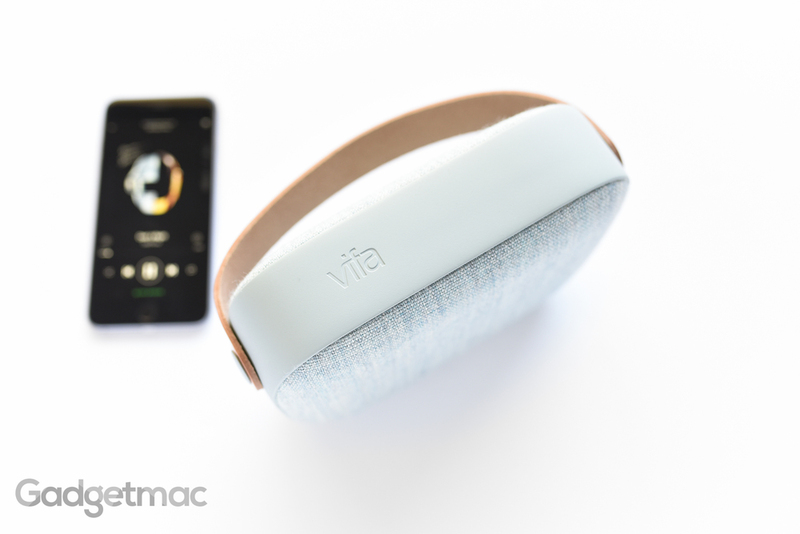 Vifa might not be as big or as widely known as Bang & Olufsen, but it's easy to see why they're just as good when it comes to uncompromised audio. Vifa is a Danish company and like all good Danish brands, Vifa's Scandinavian design prowess is unquestionably embedded into every one of its beautifully crafted, one-of-a-kind products. The Helsinki is one of three wireless speakers under Vifa's umbrella, which were all named after Nordic city capitals – the $449 Helsinki, the $799 Copenhagen, and the $1,699 Stockholm wireless soundbar. Vifa's Helsinki is the most portable of them all, features a leather carry handle and a fashionable chic design with a total of six drivers under that petite Nordic body for authentic sound reproduction. So can this finally be the portable speaker to beat the JBL Xtreme, and is it really worth its price in sound? Catch out full review to find out! 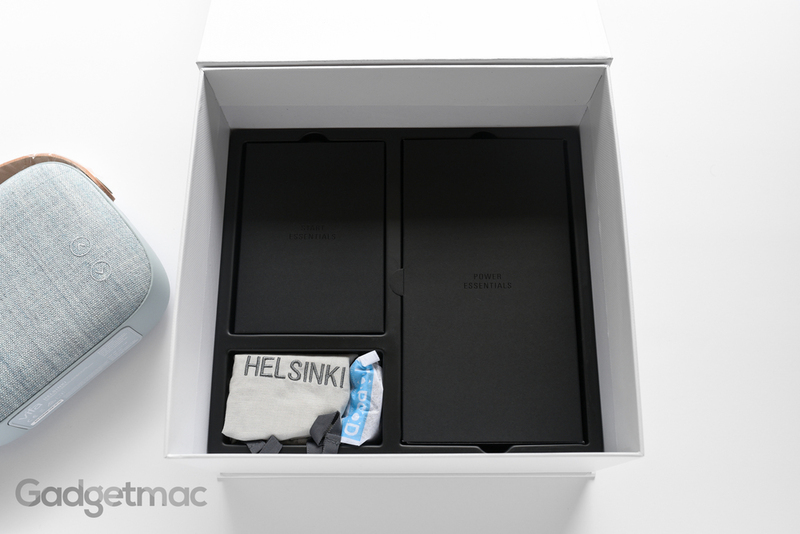 You'll treated to a wonderful unboxing experience and inside the box you'll find a few neatly compartmentalized accessories such an extra large fabric-made protective storage pouch branded with the name of the speaker, as well as a power adapter and a 3.5mm audio cable. The power adapter is not your typical USB charger so you'll only be able to charge this speaker using the included connector and brick. Depending on which country you're in, you'll get the appropriate wall plug to attach onto the power adapter. 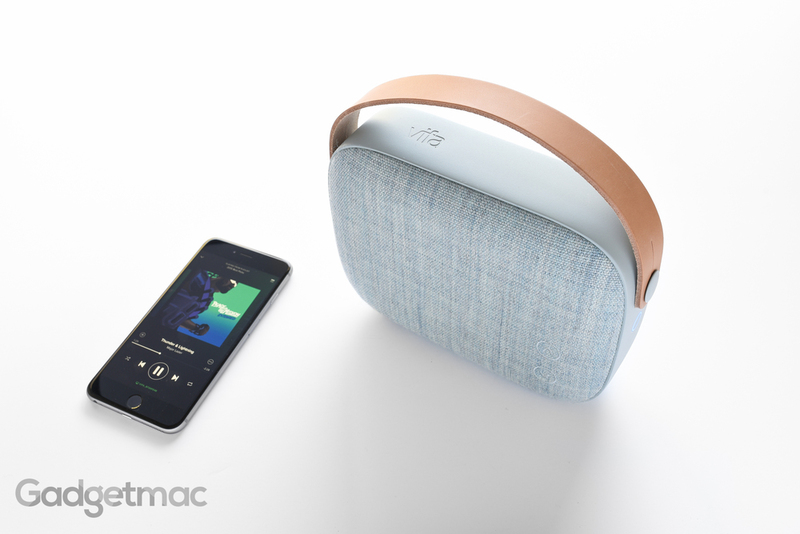 As far as what's now available on the market, the Helsinki is as pretty as a portable speaker can get. And at first glance, it unmistakably looks like a designer handbag. Though you can push back the leather handle to minimize most of that chicy goodness, or if you want to feel a little more manly, you'll be happy to know that the leather handle can be removed altogether. In all our time testing out all different types of speakers, Vifa's Helsinki has got to be the most stylishly minimalist of them all. The Helsinki is a rather small portable speaker, but it uses all of that space to maximize sound performance by housing large capable drivers. In the center are dual, 60mm Force Balanced (back-to-back) custom made woofers, dual Vifa-designed top and bottom passive radiators which work together with the woofers to produce bass that doesn't interfere with the rest of the sound as well as reduced vibrations and noise around the speaker cabinet. The two woofers are flanked by dual full-range 50mm drivers, which are essentially the equivalent of a midrange and tweeter driver in one. Vifa claims to have engineered these full-range drivers in a way so that they are optimally positioned as far apart from each other as possible in order to achieve better stereo left and right separation while placed slightly at an angle facing off to the sides, and are each isolated in their own enclosure to help reduce modulation from the other drivers. 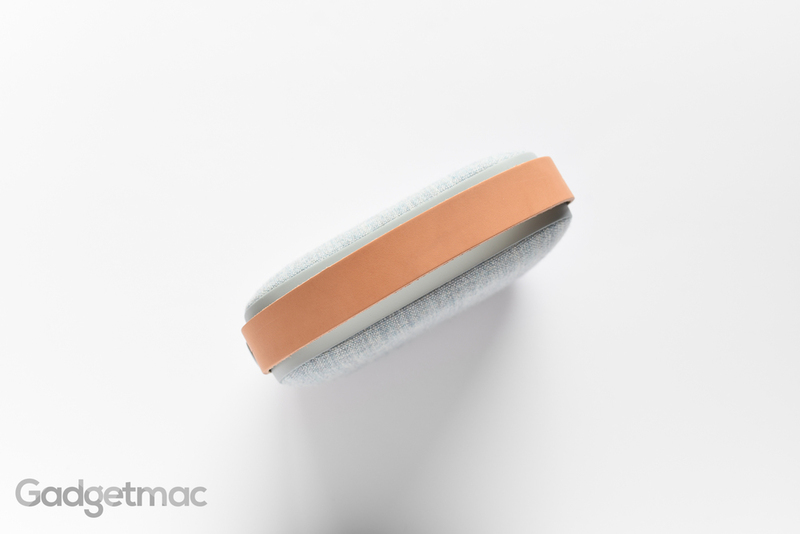 The flat and smooth band wrapped around the outer circumference of the speaker might look like some type of a rubber material from far away, but from up close, you can spot the amazing matte finishing and texture of the metal which is in fact made out of a single diecast piece of aluminum. It’s a really high quality finish that’s highly durable and isn’t going to scratch very easily. This aluminum frame not only provides a quality feel when handled, but it also serves as a rigid frame for the speaker which enhances the already solid, polycarbonate reinforced build quality. The build quality is absolutely…sensational! Which is to be expected when you’re paying this much for a portable speaker. 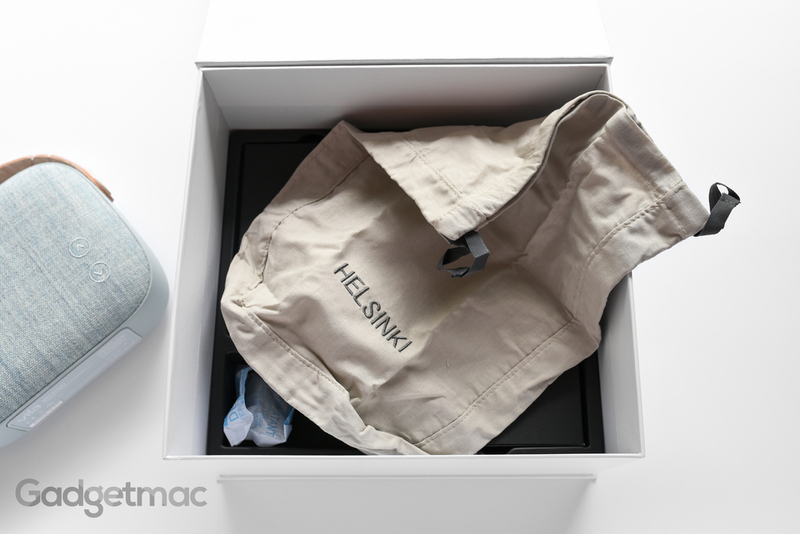 And apart from the superb build quality, I will say that the only downside to the Helsinki is the lack of weather and dust protection such as water-resistant properties. You can not get this speaker wet whatsoever. Like the back side, the front of the Helsinki is covered with a semi-rough textile made by renowned Danish textile maker, kvadrat. The finish, texture and color is absolutely impeccable. There are no wrinkles or any defects to be seen. You can get the Helsinki in various different colored textiles including this light blue, dark green, rose, and sandstone gray. As far as controls go, the Helsinki keeps it very simplistic with only two volume up and down controls located at the front side of the speaker where they are seamlessly sewn into the fabric. This is also an area where you can use an NFC device to tap and pair with the Helsinki. The only other button is located on the side and serves dual purpose. An LED ring around the metal button turns different colors to indicate various modes including Bluetooth paring, auxiliary input and idle power. There isn't much going on when looking at the back of the Helsinki apart from the power input, a battery status indicator, as well as a 3.5mm auxiliary input. You can use the included audio cable to plug into this input if you need to connect to an audio source that does not support Bluetooth. Battery life isn't that greatest at around 8 hours, that is, if you listen to your music at medium volume. It's no secrete that the Helsinki's biggest rival is the Beoplay A2 by Bang & Olufsen, which is another Danish audio company. The two are more or less in the same price range, share a very similar high-end design and both feature removable built-in leather carry handles. But that's where the similarities end. The A2 is larger, heavier and costs less. It also produces 360-degree sound. However, the Helsinki is a finer sounding speaker with a more balanced, natural sound and unrecessed highs. I couldn't believe how good the Helsinki sounded when I hit play for the first time. Don't let that smallish, chic handbagy design fool you into thinking otherwise. This is a very serious sounding speaker with a quality performance that'll trump every person who will listen to it doing its thing. It has lovely acoustic clarity with a bright treble sound signature supported by natural incisive sounding bass and a non-overpowering low-end. For what's it's worth, there's a decent amount of stereo sound separation given the boxy size of the Helsinki. Of course it's nowhere near as effective as wide sized speakers with left and right channels positioned further apart. What we would have liked to have seen is Vifa putting another two full range drivers facing the posterior of the Helsinki in order to produce bigger omni-directional sound dispersing in both directions instead of just firing audio only from one side. While not as loud as the JBL Xtreme, the Helsinki does get very loud and enough to saturate a large space with sound. What's more is that it sounds just as good at its highest volume level as it does in lower volumes. Which can't be said about other portable speakers like the Xtreme, which start to reduce bass change their audio characteristics to avoid distortion. It makes the Xtreme sound bloated on bass which bleeds into the midrange. Highs sound more forward on the Helsinki as a result and the bass is much more natural and accurate. Although not as punchy and "fun" sounding as the Xtreme, the Helsinki produces rich sound that's more clear around the mids and highs with a low-end that's not as powerful or as deep. Granted the Xtreme is much larger and heavier and thus sounds somewhat more powerful and larger than Vifa's Helsinki. For size reference: the JBL Xtreme, which can hardly be picked up with one hand, next to the Vifa Helsinki, which of course can be easily picked up one handed even without having to use it's useful carry handle. Vifa's Helsinki is the best sounding portable wireless speaker we have reviewed so far that is not only the most unique and stylish looking, but also made incredibly well. A design that is unquestionably Scandinavian, and one that is stunningly minimalist. Simply gorgeous in every way. The Helsinki manages to pack some serious hardware inside a relatively compact form factor that's easily transportable and will fit into any gear bag. If you don't mind the size and added weight of the JBL Xtreme and you absolutely love bass no matter how fat and forced it may be, it's definitely a great alternative that's cheaper and produces bigger sound. 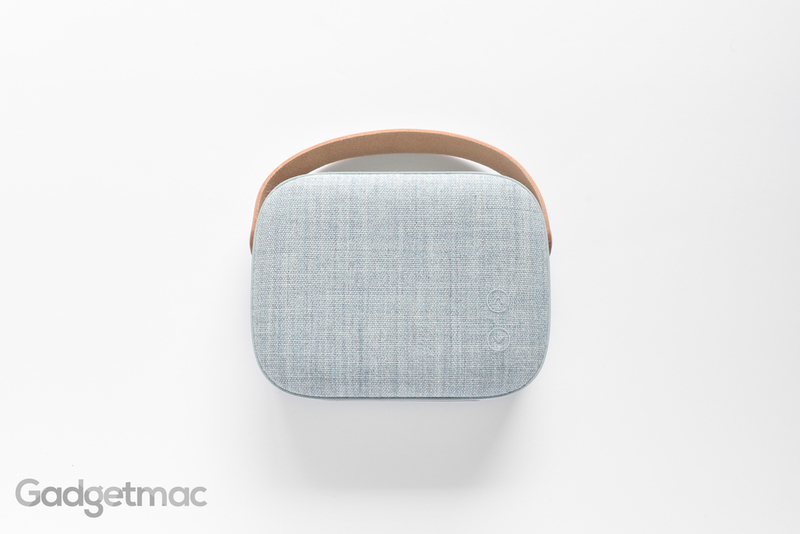 Otherwise, the Helsinki is a fantastic small and ultra-chic portable speaker with a high-end fit and finish and accurate sound that will impress you time and time again. The only downsides to Vifa's Helsinki are the lack of weather and dust protection, relatively limited battery life, and the price that comes with it.